An Eagle Scout Ceremony was held on Oct. 21st at Oakland Presbyterian Church for Eagle Scout Christopher Lee Hopson. Hopson is a member of Boy Scout Troop 33 of Clayton. Christopher joined Cub Scouts as a member of Pack 66 of Clayton when he was in the second grade. He began his Scouting career as a Wolf Scout. Chris earned all his Cub Scout ranks up to and including his Arrow of Light and the Heavy Shoulder Award. When he prepared to cross over into Boy Scouts, he visited several Troops in Johnston County and made Troop 33 of Clayton his home because of the superior leadership, Chris stated. Chris is a member of Southside Church of Clayton where he also completed his Eagle Scout project by refurbishing the entire front porch of the Youth Building to include new landscaping. Last year, Chris went to the Boy Scouts of America National High Adventure Sea Base in Islamorada, Florida. He had to become SCUBA certified prior to taking the trip. Chris was extended the high honor from the base to come back to become a Dive Master and train future Scouts. He was one of only two Scouts to be bestowed that privilege during his visit. During his Eagle Scout Ceremony, Chris was presented the Marine Corps League Eagle Scout Good Citizenship Award. 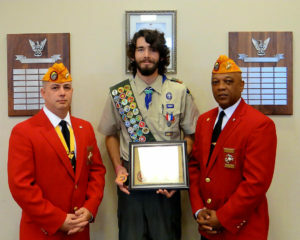 Pictured from left: Eagle Scout Coordinator Lewis W. Rice III from the Johnston County Marine Corps League Carry-On Detachment 1236, Eagle Scout Christopher Lee Hopson, and Marine Corps League Department of North Carolina Assistant Eagle Scout Coordinator Devell “Bull” Durham Jr.
Chris graduated high school as a home school student and is currently enrolled at Johnston Community College. He plans to earn a welding degree at JCC then transfer to NC State for a degree in mechanical engineering. Chris is the son of Vaughn and Kim Hopson of Clayton.